In other words, astrology is a relative truth, which means that it is good for helping us to make progress in getting around (from here to there) on the periphery of the sphere of life, but it cannot take us to the center of that sphere. Only the dharma can do that. And by "dharma" is meant our personal dharma path, the one that actually works for us, wakes us up. Heaven knows I tried to mine the traditional astrological chart for my dharma path. All astrologers do. We each need to find the path to awakening in this life. Nothing else is as important as knowing our particular dharma path, the key to how we can wake up and become aware – be realized. I studied my natal astrology chart for years, trying to figure out the puzzle that is "me". I did not then know that there was another way of looking at my astrology, in fact, another complete chart that is a map of my particular dharma path. My discovery of the Dharma Chart was actually a double discovery, because at the very same moment I could read my dharma from a chart, I realized that the traditional chart I had been using all this time was mainly a chart of my karma and not my dharma. All this time I had been trying to read my dharma from my Karma Chart, from the traditional astrological chart. Of course the Dharma and Karma charts are related and, while trying to decipher one’s dharma from looking at one’s karma is not impossible, it is very, very difficult. The number of astrologers who seriously know the Dharma Chart are few to none, IMO. And yet the Dharma Chart has been there, staring us in the face for over 400 years. Long ago, most astrologers just chose to ignore and not look at it. As mentioned in an earlier blog, the only folks who looked at the Dharma Chart centuries ago are what today we call astronomers, and even they ignored its spiritual aspects, and to me the spiritual path is the essence of life lived. Back then astronomers were astrologers, and astrologers were astronomers. But when the astronomer/astrologer Copernicus pointed out to the world that in fact everything does not revolve around us, around Earth (as we had liked to imagine), but in truth Earth revolves around the Sun, this was news that not everyone took in. In that moment of discovery hundreds of years ago, we suddenly had two astrological natal charts, the traditional earth-centered chart that had been used for centuries and a new sun-centered chart that Copernicus had just pointed out. However, rather than embracing that sun-centered (heliocentric) chart and using two charts, most astrologers turned away from it and simply ignored it. However, the astrologers who went on to become the astronomers of today embraced both the new heliocentric (sun-centered) chart AND the traditional geocentric (earth-centered) chart, and continue to this day to use these two charts. They were empowered by this new chart. And literally, as they say, the rest is history. Astronomy and Botany are the two oldest academic professions, so the astronomers must have done something right. Mathematically it is possible to derive the dharma (heliocentric) chart from the karma (geocentric) chart, because it is just another way of viewing the same planets and the same instant in time, only from a different angle or perspective. And of course that is what astrologers try to do. However, this is extremely difficult, like bending over backward, when it is so much easier just to read one’s dharma or life path from the heliocentric natal chart, which is the natural Dharma Chart. The traditional geocentric astrology chart is nothing more (or less) than a snapshot of the solar system from the point of view of Earth, embedded deep within that system. It is one view or perspective of that larger system. Wouldn’t you like to see a chart or map of the entire solar system (heliocentric) that we astrologers are so busy taking snapshots (geocentric charts) of? That is what I am talking about here. When I first got into astrology, the idea of a “dharma” chart did not exist. Studying my standard astrology chart in the early 1960s gave me an alternate way of looking at myself, call it a second opinion (and some relief) from the toxic psychological descriptions of that time, labels that were then all the rage, words like paranoid, manic/depressive, schizophrenic, etc. That was how we grew up thinking about ourselves, not at all helpful for a young person. Anyway…I soon identified with my astrology chart and inhaled its alternate description of who I was compared to the labels society had tried to pin on my generation. I just assumed the standard astrology chart of me that we all know was a map of my spirituality (or whatever we can agree to call it), when instead it was a map of my karma, the circumstances and personality in which I found myself living. Valuable? Of course, but it was nowhere near an overview, much less a map of how I might awaken and take advantage of my life. It did not clearly show a path, and I needed a path. Back then I struggled to glean specs of spiritual truth from my geo natal chart, when just by looking at my own birth moment from another (more inclusive) perspective, the path would have been clearer to see. When I finally discovered the Dharma Chart, it flipped me. 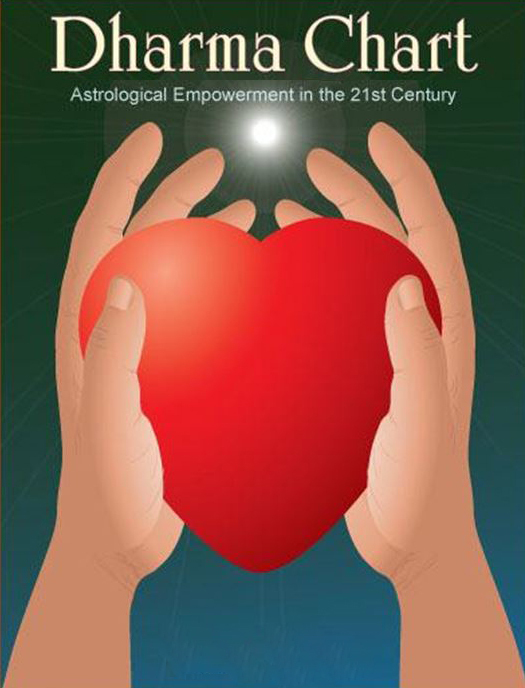 Keep in mind, as mentioned earlier, that back then there were no astrology programs until I happened to create them and give them to my fellow astrologers. Anyway, as a programmer, I naturally found myself exploring and programming various astrological techniques, and one of these was heliocentrics – Sun-centered astrology. I knew nothing about it. For me it was one more technique to program and figure out how to interpret. So there I was, peering through the lens of my traditional geocentric natal chart (and training) at this novel heliocentric perspective of myself, trying to make sense of what I saw there. And the helio chart offered a very different take on me, on who I was, what I was capable of, and so forth. Hmmmm, I thought to myself, this helio is really me. Without realizing it, I had fallen down the rabbit hole and was about to go through an earth-change in consciousness. Before I knew it, I was identifying more with my heliocentric chart than with the traditional geocentric natal chart I was used to. Wow! The traditional astrology chart had been my whole world, astrologically speaking, and I had just transferred my identification from that chart to another (in my opinion) more complete view of myself. In the helio chart I found the spirituality that I had always tried to intuit from my geocentric birth chart. Here indeed was a Dharma Chart. And this “Dharma Chart” was the "me" I had always felt that I was inside, but never had any confirmation of in my regular geo-chart. Before I knew it, I was inside the helio-chart full-time and looking out at (and through) my personality (traditional natal chart), rather than the reverse, where I had previously been – an outsider looking in, looking inward. There I was, suddenly seated on the inside looking out for the first time! It was empowering, to say the least, and it felt so natural. That’s what I meant earlier when I said I “flipped” it. “I” flipped. I suddenly was all in my body. I somehow transferred the seat of my consciousness to a deeper center and finally identified myself as a spiritual being, a traveler on a path to awakening. So if anyone asks if consciousness transference is possible, I am here to tell you it is, because it happened to me. Looking through the prism of my heliocentric chart, everything fell into line. It was a superior view, an overview, which is what I most needed at the time. And although (of course) I still use my Karma Chart all the time, I have never gone back to that old natal-chart view of my spirituality, because it was “through a glass, darkly,” to borrow a phrase. The heliocentric dharma chart is the natural way to view our spirituality, an inner self (Dharma Chart) looking from inside through the lens of our personality (Karma Chart) out at the world. All my life I had been an outsider trying to get in. I didn’t know myself. The helio Dharma Chart introduced me to myself, and I am forever grateful. And I found that my consciousness is seated, not only here on Earth, but also at the center of the Sun. Behind our personality and circumstances (geo chart) is a spiritual being and path (helio chart). Make sense? These two charts, the Dharma Chart and the Karma Chart, are just different views of the exact same moment in time, the same planets, etc. Of course each view is intricately embedded in the other, if only we could unravel it, but there is no need. We have both charts to look at. I have to laugh (and I mean laugh) when I think of how many years I struggled to read my dharma path from the standard traditional geocentric natal chart. It was not designed for that. I believe the psychologist Carl Jung would have called the Dharma Chart our Archetype, the tribe we belong to. It takes two views or perspectives to triangulate, and in astrology it is possible to look at the planets and your birth moment from different perspectives or angles, from views other than the standard natal chart that has been used for the last millennium. In fact, without some differential for comparison, how is anything known? With two (or more) perspectives, we can triangulate and get a three-dimensional view of something, in this case of our own essential nature. The Dharma Chart and the Karma Chart naturally complement one another because they are simply two different views of the same planets at the same moment. The Dharma Chart is a view of who we are on the inside, and the Karma Chart is a view of what we are up against on the outside and have to deal with and go through. In hierarchy, the Dharma Chart is the key to our karma, just as in Buddhism, dharma is the key to all karma. The helio is the mother chart, the geo the child. It took me some forty years to reduce the complexity of the helio chart patterns to something communicable, which I am sharing with you.